Today, we are announcing one of the most anticipated milestones we have ever achieved — the launch of our marketplace for flight tickets! Over the past few months, our team has worked tirelessly on integrating more than 1,000 different airlines into our marketplace, including low cost carriers and regular airlines. This will ensure that the low-end spectrum of the industry is as well covered as the upper price classes. How to book your next flight with LockTrip? 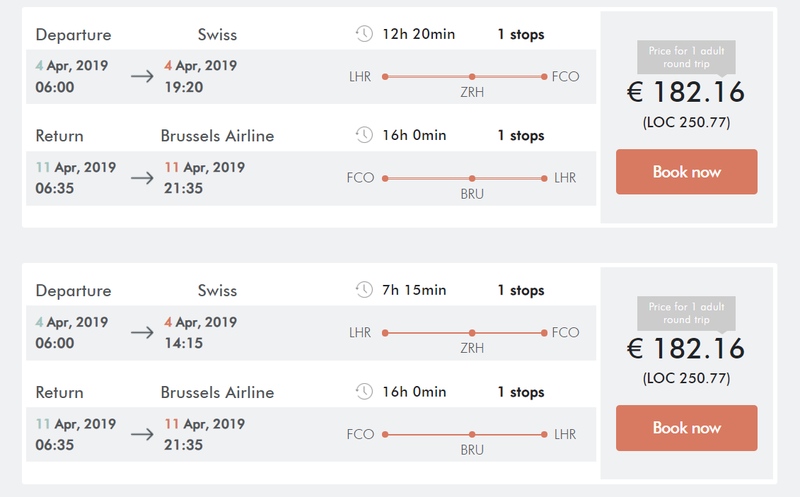 Booking flights on our marketplace is as easy as booking hotels — thanks to our well integrated setup that allows you to switch between the marketplaces with a single click and without reloading the website. Simply go to the Flights section of our marketplace, choose your destination and time period, and start searching for the best available routes. You will be presented a wide range of offers. Please take note that even though some offers might seem identical at first, they will differ in details such as the duration of layover (see below → 12 hours vs. 7 hours), number of stops or fare rules. Those variables can result in many combinations. For your convenience, we have sorted them in an ascending order by default, starting with the cheapest offer. A wide range of filtering options will be added this week to make it easier to find what you are searching for. Please keep in mind that this is the Alpha Version of the flight service. Similar to the hotel service, it will undergo a period of technical maturing. Small glitches might occur in the early stages. Your funds are safe in any case. Fiat payment is already available for your convenience. You can pay the same way like you would do on any other website too, simply by using your credit card. Of course, you can also pay via LOC tokens directly to further cut down on processing fees ($3.32 below). LockTrip would not be LockTrip without offering savings to our customers and without a proper analysis of our achievements. As a first step, we price-analyzed multiple competitors with each other and found that Momondo had the cheapest prices of all. This is why our comparison consists of LockTrip versus Momondo. The data above shows that our competitiveness depends very much on the geographical location. Keep in mind that the data above is an average for each region. Significant deviation should be expected around it. In Europe, we definitely have more work to do. And the same goes for domestic flights in Latin America. You can still find great deals that yield you some savings every now and then, but don’t expect it for your random search. We are already working on improving our inventory in these regions. Important insight: Low cost carriers have a strong presence in domestic Europe and domestic Latin America. It is important to understand that they can not be booked cheaper anywhere else than on their own website. However, LockTrip can still provide added value by combining flights with other airlines. In the States, you can expect to find a better deal on LockTrip for 60–70% of the cases. With a bit of luck, you might catch an offer with up to 10% in savings — the average being at 2–3%. Canada on the other hand will yield you good results consistently. 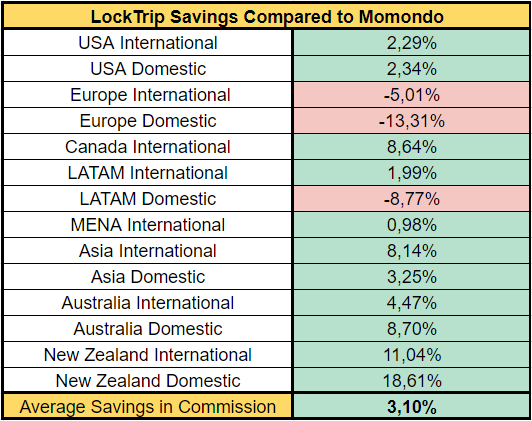 In our analysis, more than 90% of the compared flights were cheaper on LockTrip than on Momondo. Asia, Australia and New Zealand are performing very strongly. In these regions, you can expect to find offers priced 10% below the competition regularly. In some cases, savings can even reach up to 20%. While a few percent in savings might not sound like much, it is a game changer in the aviation industry where players move within extremely tight-margins. 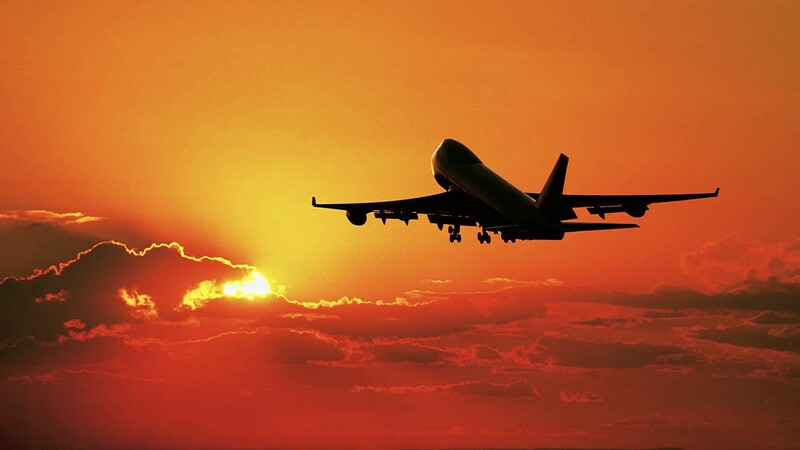 Keep in mind that unlike our hotel offerings, flights can be listed on aggregators like Skycanner or Opodo. Out-competing others on such a platform by even 1% would place LockTrip at the top position and funnel high quality traffic towards our marketplace, further leveraging our hotel service. This is why the current results are very encouraging for the starting point. And with our competitiveness to be improved further as we progress (similar to how we are doing with the hotels), things will only become more exciting. We wish you pleasant flights!